The LG Hi-Fi Plus is perfectly fitted to the LG G5's exterior. 1xSilver color 2704 HIFI USB to S/PDIF Converter USB DAC. The primary purpose is to create a high quality S/PDIF digital audio output signal that can connect to your existing DAC. Use it standalone or build right into your DAC. Ustar AK4497 AK4497EQ HIFI audio DAC decoder AK4118 PCM 384K with opa1611 opamp. Shipped with USPS First Class Package. XMOS asynchronous interface. - Cirrus CS4398 decoding chip. - D30 supports USB ,Coaxial and Optical Fiber. Input range 16-24bit/44.1-192KHz. - 1 x TOPPING D30 DAC. 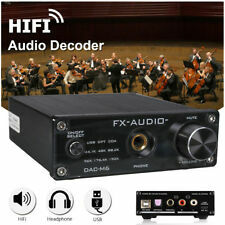 - Digital audio input interface: USB Coaxial Optical Fiber. ES9028PRO: Custom sound signature is supported via a fully programmableFIR filter with 7 presets. 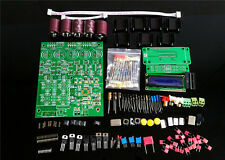 ES9028 /ES9018 Q8 HiFi Audio DAC Decoder DIY KIT. ES9018S: The SABRE 32 Reference audio DAC’s 32-bit Hyperstream architecture can handle full 32-bit PCM data via I2S input, as well as DSD or SPDIF data. CHORD Qutest D/A Converter. Condition is used but perfect condition. DSD support: Native playback supported. DSD64 (Single) to DSD512 (Octa-DSD). DAC / Audio Decoder. HiFi Art-Elfidelity. T5 lossless digital music player, the main chip SP3306AL can play APE, FLAC and other lossless music formats, real output lossless audio quality, with digital optical, coaxial and a set of analog RCA signal output. BluDento BLT-2 Is Bluetooth aptX low latency receiver Only. It is NOT Bluetooth Transmitter. This product does not work with any Bluetooth headphones/earphones/speakers/sound bars. This device connects a modern smartphone easily via Bluetooth to a stereo set so you combine the convenience of the smartphone with a high quality music playback at the hi-fi stereo set. DAC / Audio Decoder. HiFi Art-Elfidelity. Audio HiFi & DIY. DAC coaxial / Optical support: 16bit, 20bit, 24bit etc. Digital Interface / Sound Card. Nobsound®——Dou​k Audio. Bluetooth Audio Devices. Digital Amplifier. Optical / Coaxial: 24bit / 192kHz. Support 3 ways of audio input: PC-USB, Coaxial, and Optical. Advanced gilded black coaxial RCA for unbalanced analog audio input and for the first output. Audio Input: PC USB / Coaxial / Optical. Audio Output: Gold-plated RCA,6.35mm headphone jack. Power input:Dc12V more than 1A. Audio Inputs:Coalxial/optical,PC-USB. One year Warranty. Machine weight：0.33kG. 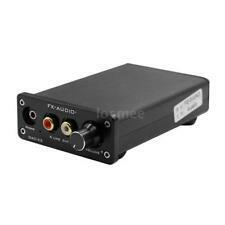 Headphone amplifier output power Output jacks:6.35mm Headphone jack/RCA. USB transmission: Asynchronous. USB: Windows7/8/8.1/10;Mac OSX10.6. USB bit depth: 16bit,24bit,32bit,1bit. USB：DSD 2.8224/5.6448/11.2896/22.5792 MHz. Play DSD256 --- LED Red. DSD format perfect support : DSD64 (1bit, 2.8224MHZ), DSD128 (1bit, 5.6448MHZ), DSD256 (1bit, 11.2896MHZ). DSD decoding have DSD64，DSD128，DSD256 etc capabilities. DSD test, containingDSD64, DSD128, DSD256 the DSD file tests LINK. Selling because got as gift and I don’t need it. Sealed, brand new. Compatible with apple mobile products which has lightening connection. (From San Jose California :). Model: PCM2704. Type: DAC Based Sound Card Module. Signal-to-noise ratio: 98 dB. Headphone output power: 12 mW (RL = 32 ω). Quantity: 1x. Output: 16bit 32KHz/44.1KHz/48KHz -- 2-channel analog output & S/PDIF output. Only pcb as main picture. USB DAC Digital-To-Analog Converter Headphone Amplifier. With the USB DAC, you can turn any computer or laptop into an audiophile playback device. The USB DAC supports PCM files up to 32-bit, 384kHz and supports DSD64, DSD128, and DSD256 playback. Topping A30 Hifi Desktop Headphone Amplifier 3.5mm/6.35mm Headphone output. 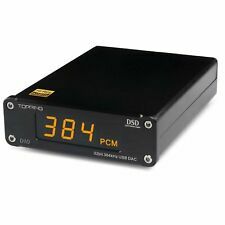 TOPPING D30 DSD Audio Decoder USB Coaxial Optical Fiber XMOS CS4398 24Bit 192KHz. Headphone output 1 x 6.35 headphone jack; 1 x 3.5 headphone jack. 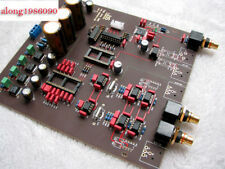 This product is finished board, using the latest audio DAC ES9038 Q2M as the core design. CSR8675 Bluetooth 5.0 chip, Support APT-X APTX-HD lossless output Ultra HD format, Support 24bit/96Khz sampling rate. THD N:DAC out 0.0008%. Signal to noise ratio:DAC out 97dB. The DAC output level:2Vrms. Headphone amp 0.003%. Headphone amp 88dB. Headphone output power:103mW@THD N=0.1%,32Ω. Player Digital Dial Decoder. 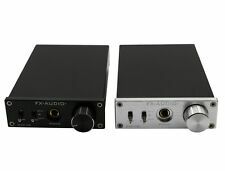 Elfidelity Sound Sourced USB II Mini XMOS DAC / Interface / Headphone amplifier. HiFi Art-Elfidelity. DAC / Audio Decoder. Headphone Amplifier. Hi-Fi Tube Amplifier. Digital Amplifier. Integrated Amplifier. Q8 it is using the super DAC chip, with professional circuit design and reasonable circuit layout to building a super DAC. More products to building a finished DAC 1 x Allembled DAC board. We majored in Hifi audio DAC, amplifier， preamplifier ,headphone amplifier and other hifi DIY audio parts. Chip:AD1865 AK4118. 1 x AD1865 decoding r2r decoding nos mode DAC finish product. it is finished product,the sound quality is more HIFI. 3, feelings are very good, feelings are more real than the way of OS, the sound field is also very real and different styles of OS, I personally prefer this style;. Decoder chip: AK4490. Reception format: SA9027 (USB Module). Nobsound®——Douk Audio. Douk Audio——————All THE BEST！！！. DAC / Audio Decoder. Nobsound®——Dou​k Audio. Bluetooth Audio Devices. Digital Interface / Sound Card. With PCM2706 ES9023 USB DAC. USB receiver chip with the most enthusiastic use of the United States TI's PCM2706, 16BIT / 48K. Reference Bayern power A2 headphone amplifier original circuit design, combined with our designers to redesign and improve the design of the A2-PRO professional headphone amplifier, with professional-level monitoring sound quality. HIFI I/V conversion LPF circuit. - Input: optical, coaxial, USB. 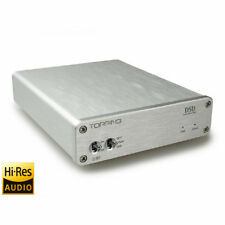 - Sampling rate: 16BIT-24BIT / 44.1K-192KHZ (optical, coaxial), 16BIT / 44.1K-192K 24BIT / 44.1K-96K (USB). - USB cable × 1. - Audio SNR: 110DB.